Just 12,000 miles away from the windswept shores and heather scented Glens of Scotland; Whisky distillation in New Zealand – dates back to 1867 - Dunedin, New Zealand not long after the arrival of Scottish settlers in Otago in the 1830s. Distillers found it tough times in the 1870s due to heavy government regulations. 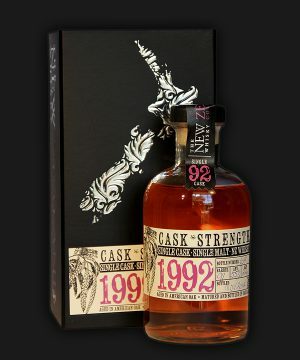 But the industry began to strengthen in the 1950s and perked up with the opening of the world's southernmost distillery, Willowbank, in Dunedin in 1974. In the 1980s, the world's then largest distiller Seagram's bought Willowbank and it began to flourish - sold to Foster's of Australia and in 1997 the distillery was closed. The whisky remained in storage for many years before changing hands then eventually going to auction in 2010, to the joy of enterprising whisky enthusiasts who could taste the potential of well-produced malt. Various independent bottlings have been released since, with manygoing on to claim International accolades and awards. There have been recent experiments to produced a new world-first whisky distilled using 100 per cent New Zealand malted barley that has been smoked with manuka wood, giving it a unique manuka- accented smokiness.